The Crammed Wraith (ニセシャコモドキ?, lit. : "Fake Pseudo Mantis Shrimp") is an enemy found in Hey! Pikmin. 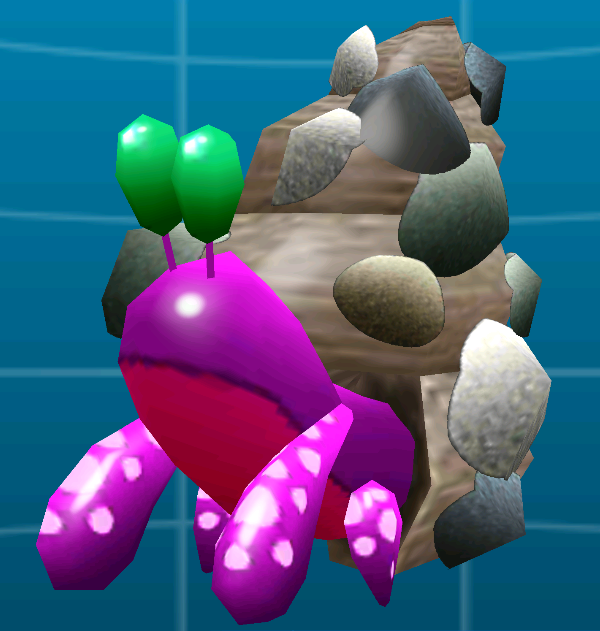 It is a large, purple, snail-like creature with four spotted arms and green eyes. It attacks by pushing Olimar and Pikmin backwards with a tall shell on its back. The Crammed Wraith will sit idly, blocking a path, until it detects Pikmin approaching. It will then walk backwards quickly to push the Pikmin away from their destination, denying them access of wherever it is blocking. Echo Cavern: The only three in the game appear here. The first two are found near the middle of the level. One is sleeping on the ground, while the other is awake and found on a branch. The final one is near the end, found under the stones that fall when bomb rock explode near them. The Crammed Wraith can only be defeated by throwing Pikmin over its shell and landing them onto its head, where it can be damaged. Alternatively, a single bomb-rock is enough to take it out. This article or section is in need of more or better images. A sleeping Crammed Wraith in Echo Cavern. This page was last edited on January 27, 2019, at 11:28.